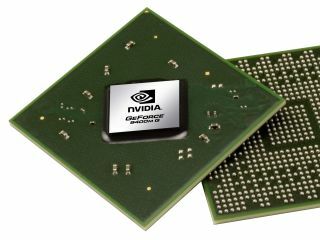 When Steve Jobs talked about Nvidia's GeForce 9400M during his MacBook launch presentation he waxed lyrical about the new chip's super capabilities. This could be seen as just another Jobsism. After all, many will see the 9400M as just another notebook graphics chip. But those who do are missing the point; the 9400M was not just plucked out of Nvidia's labs by Apple (with slight poetic licence perhaps) but it's an integrated, not dedicated, graphics chip. So what does that mean? The key point is that Nvidia can now target the segment of the market it so far could not; the 95 million notebooks sold a year with no dedicated graphics on board; the bog-standard Intel notebooks of this world. That means you'd be able to play high-end games on virtually anything. Basically, Nvidia is appealing to those of us who go out to buy an Intel notebook, but who will no longer stand for sluggish graphics or non Vista Premium Ready performance. In other words, most of us. Nvidia's Rene Haas was at pains to point out that there would be little price premium for consumers between choosing a notebook featuring the 9400M and another laptop using an integrated chip, although until other OEMs launch (imminently it seems). Haas says the new chip brings visual computing to standard notebooks and cited the enhanced GPU capabilities of new apps. He demonstrated Adobe Creative Suite 4 which can take full advantage of an extra GPU. "If Adobe Photoshop finds a local GPU, it will adapt to it. It's a bit of a watershed event" adds Haas. The 9400M is half the size of compteting integrated solutions and Nvidia claims it is "five times faster." Nvidia also showed us demos comparing the integrated performance of the Intel GM45 on a new Sony Vaio and the MacBook using Call of Duty 4. Interestingly the MacBook Pro has another trick up its sleeve. It sports two graphics chips inside. No mention of Nvidia's SLI dual-GPU tech here; the 9400M is joined with a 9600M GT – pretty powerful stuff – that can be switched off (though on the MacBook Pro, you annoyingly have to log out first). This neat dual-chip solution will no doubt appeal to many manufacturers, and as with the 9400M itself, expect other manufacturers to jump on board with their own second GPU choices. Nvidia is understandably exited about Apple being first with the chips (and Jobs' glowing report of course). "They are an extraordinarily innovative company and an extraordinarily secretive company," said Ken Brown in a phone briefing with TechRadar after the MacBook launch.